Weekend Historical Happenings: 12/15/12 - 12/16/12 ~ The History Girl! Self-guided candlelight tours of Lambert Castle's beautifully decorated rooms, Christmas trees and gingerbread creations. See the Castle at its most festive, festooned with lush greenery and arrangements created by local florists. Holiday-themed music and refreshments will be provided. Admission: $12 for adults, $10 for seniors, $8 for children over 6. Open Saturday, 6:00 - 9:00 pm and Sunday from 1:00 - 4:00 pm and 6:00 - 9:00 pm. Reservations suggested. Lambert Castle is a lavish Victorian estate built at Garrett Mountain in Paterson by silk magnate Catholina Lambert. For more information, please visit www.lambertcastle.org. On Saturday, there will be a program entitled FEMA assistance for the Cultural Community: A Forum for Private Nonprofits and Local, Regional, and State Governments. The forum will be held at the Wilson Hall Auditorium at Monmouth University in West Long Branch from 1:00 - 4:00 pm. If your facility and/or cultural collections were damaged by Hurricane Sandy, you have until December 30, 2012, to apply for disaster aid from FEMA through the Public Assistance program. This forum will provide the information cultural heritage stewards need to know about applying for federal disaster aid. FEMA representatives will explain how to apply to the Public Assistance program for repairs to structures and the recovery of collections; assistance provided by the Small Business Administration to private nonprofits; and the Individual Assistance program that may be available to artists. The presentations will be followed by a Q&A session. This program is sponsored by the Heritage Emergency National Task Force in cooperation with the following New Jersey State partners: the Council on the Arts, the Council for the Humanities, the Historic Preservation Office, the Historical Commission, the State Library, the State Archives, and the NJ Association of Museums. Enjoy holiday music at the Wallace House State Historic Site this weekend. On Saturday, Linda Russell will perform, and on Sunday there will be Robert Mouland. Both concerts will be at 7:30 pm in the office. The entrance fee is $10 and reservations should be made in advance by calling 908-725-1015. The Wallace House is located at 71 Somerset Street, Somerville. Visit the Abraham Staats House home for the holidays! The Abraham Staats House will be decked out in festive finery and hosting a number of musical programs Saturday and Sunday! Built c. 1740, the house was home to the Dutch Staats family for nearly two centuries and is now under the care of the Borough of South Bound Brook. On Saturday and Sunday, from 12:00 noon - 5:00 pm, the public is invited for a holiday visit. Each room of the house is festively and individually decorated by South Bound Brook community organizations in celebration of the holiday season. Enjoy music of the season as well. On Sunday, December 16, enjoy the sounds of the Somerville High School Jazz ensemble under the direction of Mr. Matt Krempasky. Stroll through the many rooms, learn about the history of the home, and get in the holiday spirit as you enjoy the seasonal displays and exhibits, as well as the Christmas music of the 18th century played on the dulcimer, guitar and fiddle by Tom Harabin. Admission and parking are free, but donations are accepted. The Abraham Staats House is located at 17 Von Steuben Lane, South Bound Brook. 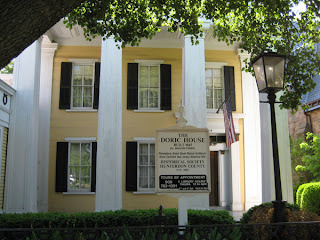 For information call Tom at 732-469-3198, or visit www.staatshouse.org. New Jersey's Original Santa Claus Special celebrates its 21st continuous year of operation in 2012. 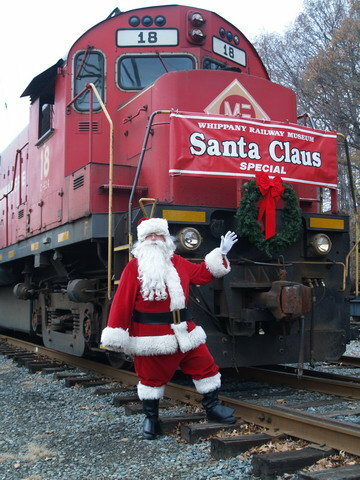 Celebrate the wonderful Christmastime spirit and joy with a ride on the Whippany Railway Museum's Santa Claus Special! Tickets for this annual Christmas tradition make great gifts for the kids and the entire family. The 10-mile, 45-minute round trip excursion from Whippany to Roseland and return allows passengers time to enjoy the festivities of the season and the merriment on the train. All of our past trips over the last 20 years have been complete sell-outs, and seeing the excited faces of the children as they climb aboard the Christmas holiday-decorated trains, ensures an afternoon for family fun. During each excursion, Santa makes his way through the train and visits with the children on-board. Santa's helpers follow along, giving the kids a special gift from Santa. Be sure to bring your camera and take pictures of the kids with Santa, so they can always remember their day on-board the train! So round up your family and friends and climb aboard for some great Christmastime fun and laughter! Ordering tickets is fast and easy! Trains depart at 1:00, 2:00, 3:00, and 4:00 pm each day, rain or shine. The Whippany Railroad is located at 1 Railroad Plaza, at the Intersection of Route 10 West & Whippany Road in Whippany, NJ. Train fare: Adults: $13.00, Children (under 12): $8.00, Infants (1 year and under): Free. Holiday greenery, ribbons, hydrangeas, magnolia leaves and lots of clever decorating ideas will greet visitors at the 1845 Doric House at 114 Main Street in Flemington. The museum, open at no charge by the Hunterdon County Historical Society, will welcome guests for tours Saturday and Sunday. Hours each day are 1:00 to 4:00 pm. Festive decorations designed by the Community Garden Club of Hunterdon County and the Hunterdon Hills Garden Club make the first floor of the high-style Greek Revival house particularly appealing. Working with the theme Celebrating the Season, the Community Garden Club has swagged the elegantly curved staircase banister in the foyer with pinecones, oranges, hydrangea, pepper berries, nut balls, and golden bows. Gifts are piled on the Windsor settee and a trio of nut topiary trees decorates a table. Continuing into the dining room, a formally set table glows with ribbons that stream from the crystal chandelier to gifts at each place setting. Windows are dressed with swags and doors with holiday wreaths. In the high-style parlor, the Hunterdon Hills Garden Club's theme, Waiting for Christmas, uses magnolia leaves and hydrangeas, burgundy ribbon, and white accents of chandelier crystals and crocheted snowflakes on the tree and around the room. Old-fashioned tree candles also decorate the tree and toys from the mid-1800s lay under it. Stockings hang from the marble mantle. At the end of the tour, guests have the choice of voting which club's decorations they like best. The winning club will receive an award. Besides the holiday decorations, guests will see new appointments in the parlor, including an 1845 Argand-style whale oil chandelier created by Charles Tiffany of New Hope, an 1830 portrait of Anna Hope Foster of Clinton (hanging over a Chippendale-style desk made by her father in 1790), and new 19th-century-style lace panels at the windows. In the foyer, the Society has added a collection of nine walking sticks dating from 1722 to 1917. The Historical Society of Andover Borough cordially invites you to attend the Andover Museum's Historic Christmas Tree Lighting Ceremony on Sunday at 2:00 pm during the museum's Holiday Open House, from 1:00 - 4:00 pm. Col. Ardolph Loges Kline was born in 1858, to Anthony Kline and Margaret Busby Kline of the Springdale section of Andover and attended school in Andover and Newton, NJ. In 1877, he started working for a men's clothing company in New York City and joined the New York National Guard as a private. When the Spanish-American War of 1898 began, he was named a Lieutenant-Colonel, and in 1901 a Brevet Brigadier-General. He was a senior officer of the New York National Guard and a Republican politician who became the acting Mayor of New York City on September 10, 1913 upon the death of Mayor William Jay Gaynor, serving for the rest of the year. Mr. Kline later became a United States Representative from Brooklyn (1921-1923). He married Francis A. Phalon and they had one daughter. Ardolph Kline died in 1930 in Brooklyn, NY and is buried with his wife Francis in the Holy Cross Cemetery in Brooklyn, NY. During Mr. Kline's short period as the acting Mayor of New York City, he initiated the annual New York City Hall Christmas Tree Lighting Ceremony on December 24, 1913, by inviting a young boy to help him light the first Christmas tree at City Hall. This small gesture started a tradition which still continues to this day at the New York City Hall. So, today in honor of a boy from Andover, who carried his political dedication and personal vision to the steps of New York City Hall, we continue with this historic tree lighting tradition in his hometown, nearly a hundred years later. The Andover Museum is open to visitors from 1:00 - 4:00 pm on Sunday. It is located upstairs in the Andover Borough Municipal Building at 137 Main Street/Route 206, Andover Borough, NJ. There is ample parking located behind the building and the museum entrance is on Smith Street. The museum is open to the public. For additional information please call 973-786-7833 or e-mail historyandovernj@aol.com. "Welcome, Christmas, bring your cheer. Cheer to all Whos far and near." Roastbeast on a Bun, Seuss Spuds and Cindy Lou Who Cider are just some of the Grinchy grub being served at Liberty Hall's Whoville Feast on Sunday from 11:30 am - 1:30 pm. A tour of Liberty Hall decorated for holidays will follow the feast. Program Fee: $20.00 per child, $25.00 per adult. Reservations Required, call 908-527-0400. Liberty Hall is located at 1003 Morris Ave, Union, NJ 07083. For more information, call 908-27-0400. Thomas Nast's Historical Icons - including Santa Claus! On Sunday join Macculloch Hall Historical Museum's F.M. Kirby Curator Ryan Hyman as he presents "Thomas Nast's Historical Icons". Mr. Hyman will discuss Thomas Nast (1840-1902) who is known as the Father of American Political Cartoons. Nast is most famous for popularizing the images of the Democratic Donkey, Republican Elephant, Uncle Sam and Santa Claus among others. He is also known for his political cartoons which he created for Harper's Weekly for about a twenty-five year period from the early 1860s through the mid-1880s. Learn more about Nast's depiction of these iconic images as well as his popularization of the modern day image of Santa Claus at this special seasonal presentation. 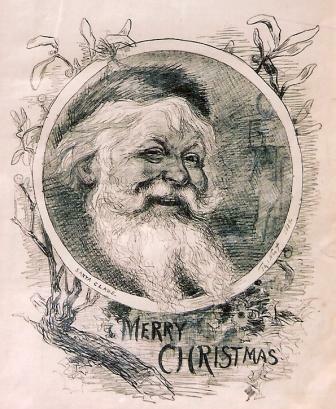 During December and January the Museum is featuring its extensive collection of holiday-themed original artwork by caricaturist Thomas Nast. Visitors will find more than thirty of Nast's original Santa and Christmas images throughout the museum's galleries and period rooms. Macculloch Hall Historical Museum has the largest collection of Nast originals in the nation. Mr. Hyman's program will be presented in the school room gallery where vivid examples of the antique Oriental rug collection are being showcased complemented by textbook examples of fine porcelain, silver, glass and furniture collected by Museum founder, W. Parsons Todd. Tickets for Sunday's program will go on sale at 1:00 pm, no advance sales. The presentation begins at 4:30 pm. House tours (regular admission applies) take place throughout the afternoon and the last tour leaves at 3:00 pm. The upstairs galleries will remain open until 4:30pm however the "A Fine Collection" exhibit will close at 3:00 pm in preparation for the program. Tickets are Adults $8; Seniors & Students $6; Children 6 - 12 $4. Members and children under 5 are free. Speaker tickets include admission to take part in a house tour through the period rooms of the Museum, which are decorated for the holidays, if visitors arrive during the afternoon and sign up to tour. Visitors can also find unique gifts in the museum's expanded holiday shop, including a number of items with Nast's Santa Claus image, and have the opportunity to enjoy the upstairs gallery exhibit "Home for the Holidays" which includes holiday ornaments and toys on loan from private collectors. The museum is open for house and exhibit tours on Wednesdays, Thursdays & Sundays from 1:00 to 4:00 pm. The last tickets for admission are sold at 3:00 pm. Admission is $8 Adults; $6 Seniors; Children 6 - 12 years $4, Children 5 years and under and Museum members are free. The Museum closes for the holiday break at 4:00 pm on Thursday December 20th and reopens for tours at 1:00 pm on Wednesday January 2, 2013. For information, call the Museum weekdays at 973-538-2404 or visit www.maccullochhall.org Macculloch Hall Historical Museum, 45 Macculloch Avenue, Morristown, NJ 07960. "To Cast a Freeman's Vote"
The Perth Amboy Ferry Slip Museum presents a Random Act of Culture on Sunday at 2:00 pm when Gordon Bond presents his program on Thomas Munday Peterson entitled "To Cast a Freeman's Vote." Peterson was the first African American to vote after the passage of the 15th Amendment in 1870. He was also the first African American to hold office and to serve on a jury in Perth Amboy. The lecture is being given by speaker and author Gordon Bond who has extensively researched Thomas Mundy Peterson for a book he is currently writing. There is no admission and refreshments will be served, but donations will be accepted toward repairs to the Ferry Slip Museum which was damaged during Superstorm Sandy. This program will be held at the Perth Amboy YMCA Theater on New Brunswick Avenue. For more information, call 732-442-5425.